The staff lunch room. Not usually a place that you really want to be in…except to eat of course! Most places don’t put a lot (or any) effort into designing something nice for their staff; it’s often a room with stackable chairs, fold out tables, a microwave, coffee machine etcetera…but style? No. Comfort? An old sofa…maybe. A calm retreat? Only if you are in there by yourself! A couple of years ago I was approached by the Principal of the school my son attends (who is also a friend of mine) and she asked me if I could re-design their staff lunch room as a surprise for the all female staff. The budget was tight…$1000, but could I do something to the room to make it nice? I have known much of the staff for many years, and they are teachers that give 110% to the kids they work with! So naturally, I wanted to do the best I could to give these women a place that they could have some respite from crazy kid-land, eat in peace, and a give the very bland space a serious style makeover. I was all in! 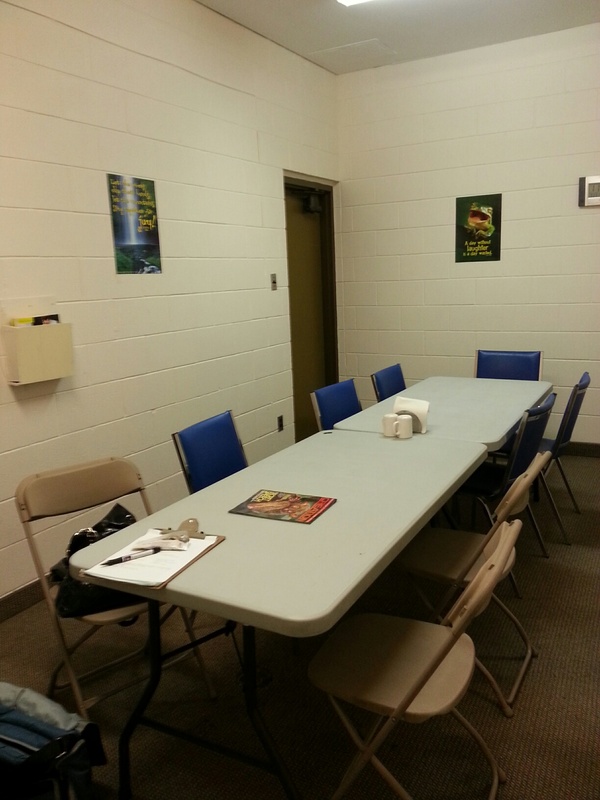 The lunch room in question was in the basement with no natural light. 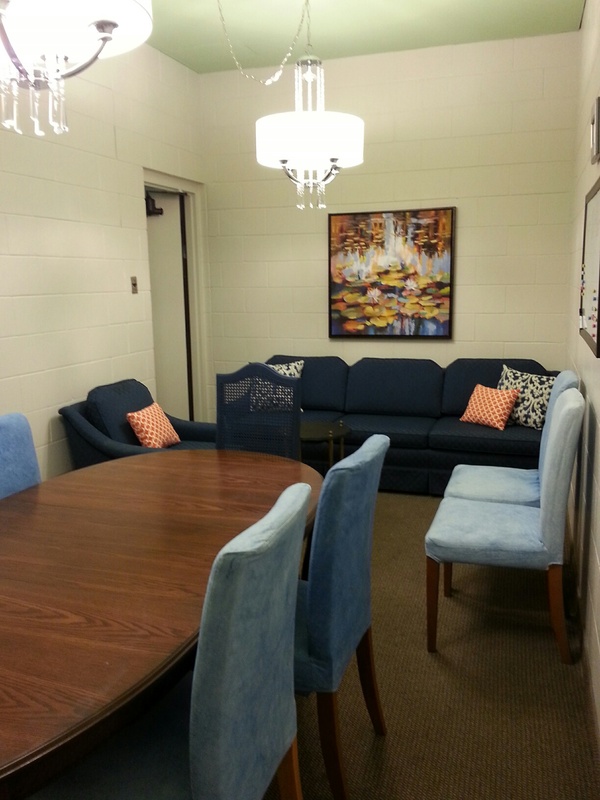 It had fluorescent tube lighting, brown-ish carpeting and was painted an ordinary beige. The chairs looked uncomfortable and the tables were plastic. The carpet had to stay but everything else could be changed—as long as we stayed in budget! Thankfully I had the help of the school’s general handyman to assist on a few things and a painter who was willing to donate his services—I could not have done this project without them (Thanks Jerry and Pete)! My main directive was to find items for the best price I could and stretch every dollar to transform this space! 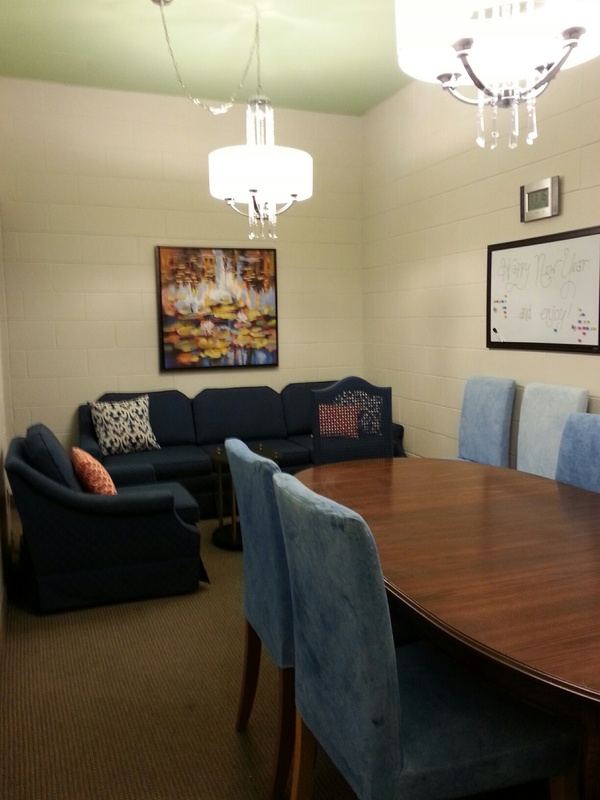 I started with the lighting…those fluorescent tubes just had to go! 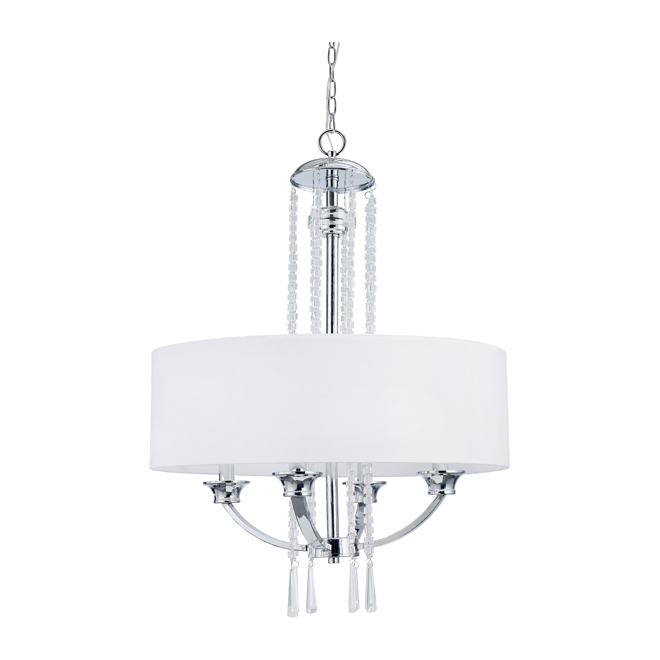 I found some lovely drum pendant lights at Rona for just over $100 each and I used that as the jumping off point. They were elegant but not over the top and worth the splurge as I needed two. I started combing Kijiji for dining sets and sofas hoping to find something in good condition and yet not hundreds of dollars…a very time-consuming process but it yielded great rewards! I found a vintage dining set that had cane back chairs asking $100; when I went to go and look at it and told her what it was going to be used for, she offered to give me the table and chairs for free! I decided to paint a couple of the chairs and leave the table as it was. It was Divine! I also found some gently used Henriksdal chairs from Ikea; I kept the frames and purchased new white slipcovers for them…but they didn’t stay white…more on that later! The sofa was a little harder to find. I wanted to add some color to the room, but also put in something that didn’t overwhelm the small space and wasn’t stained or droopy…only the best would do! After about three weeks of looking everyday, a lovely blue sofa and chair set popped up on the feed. They had sat in a living room barely used and were in like-new condition! 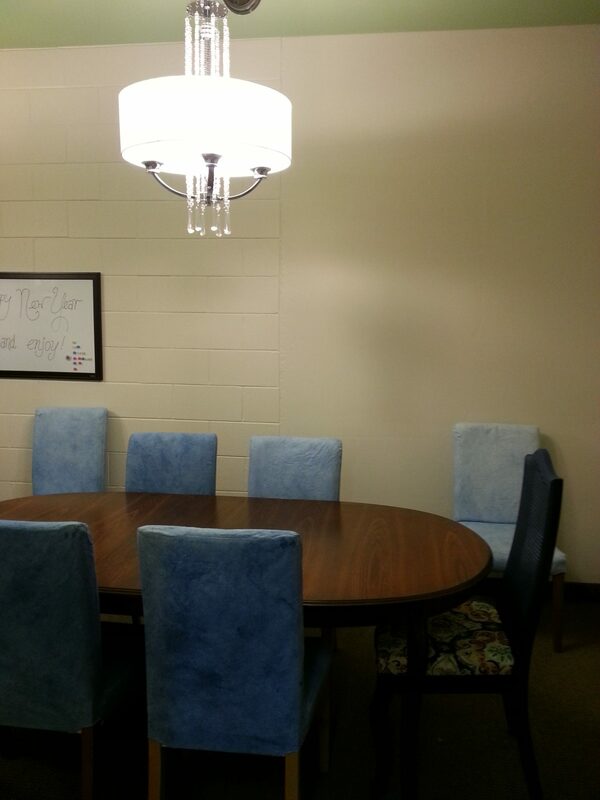 $200-ish dollars later, I had comfy furniture for our lunch room! I painted the walls Pale Oak by Benjamin Moore and the ceiling a soft green just for fun. Now this sofa took up one whole wall on one end of the room so a large piece of art was needed. I looked and looked and there just didn’t seem to be the “right” thing to anchor this focal point in the room. 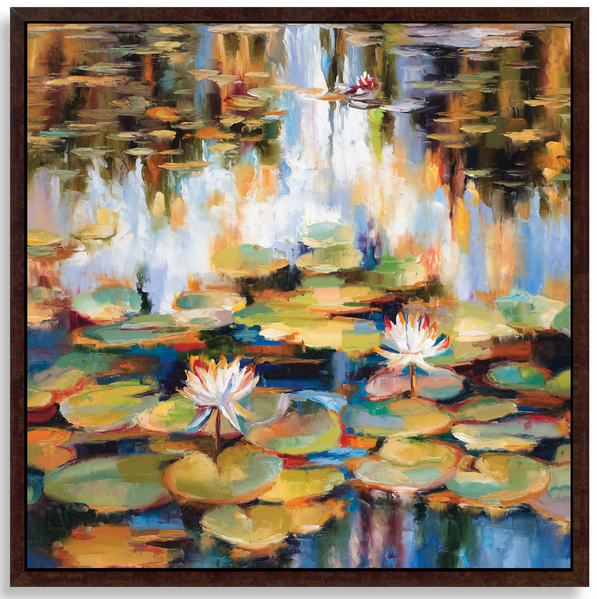 Eventually I came across this painting for about $150 that was just PERFECT from Bed Bath & Beyond’s website. It was a splurge for sure, but it brought everything in the room together so it was well worth it! There were so many colors in this painting—it brought the room to life! I also had some photography donated by a talented artist that I hung as a grouping on the other end of the lunch room; it finished it off perfectly. Now that all the larger pieces had been purchased, I headed over to Bible for Missions Thrift Shop and found a sweet side table for $10 and a magazine rack for less than $5 to finish off the space. 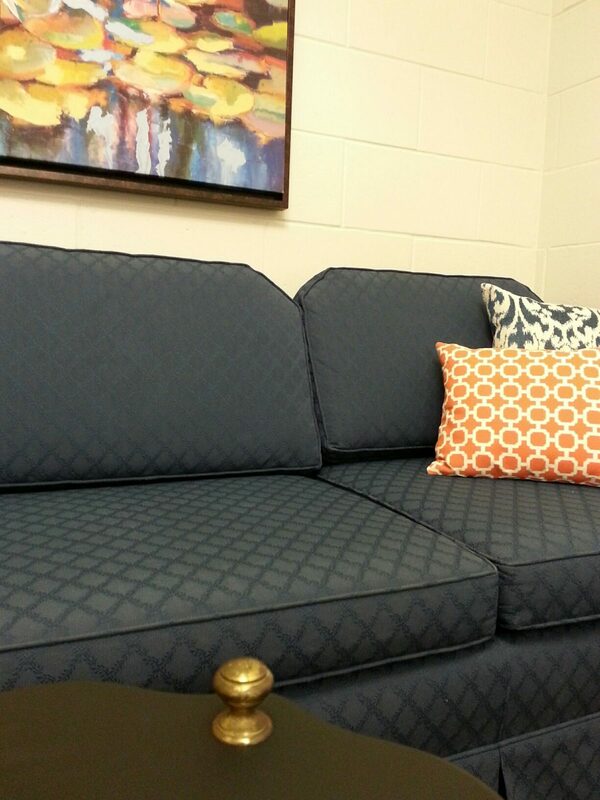 I decided to paint the side table black and also added some orange cushions for the sofa to really make things cozy. To carry over the blue into other areas of the room, I got creative! I purchased a can of Napoleonic Blue Annie Sloan Chalk paint from The Painted Bench and used it to paint the cane-back chairs and also as a dye for the white Ikea slip covers. I honestly wasn’t sure how the dye would turn out, but I was so happy with the final results! I diluted the paint in a large plastic tote I was no longer using. I put two slipcovers in at a time and let them soak in the dye (giving them an occasional stir) for about 24 hours. I took them out, hung them to dry, and I had me some soft denim blue slipcovers! The coloring wasn’t perfectly even, but that didn’t bother me…they were exactly what I wanted so I was happy with the outcome. As we had decided to do the makeover during Christmas break, I was so excited once the first day of classes in January rolled around! The ladies were SO surprised and had all good things to say about the transformation of their staff lunch room. From an very uninspiring space, this little room was transformed into a place that these ladies enjoyed every single day…and I was thrilled to be a part of it! Decide what your splurges will be. I decided early on that the lighting would either make or break the room; I took about 1/3 of the budget to spend on just this item alone but it made the biggest difference! I also didn’t cheap out on the artwork over the sofa. 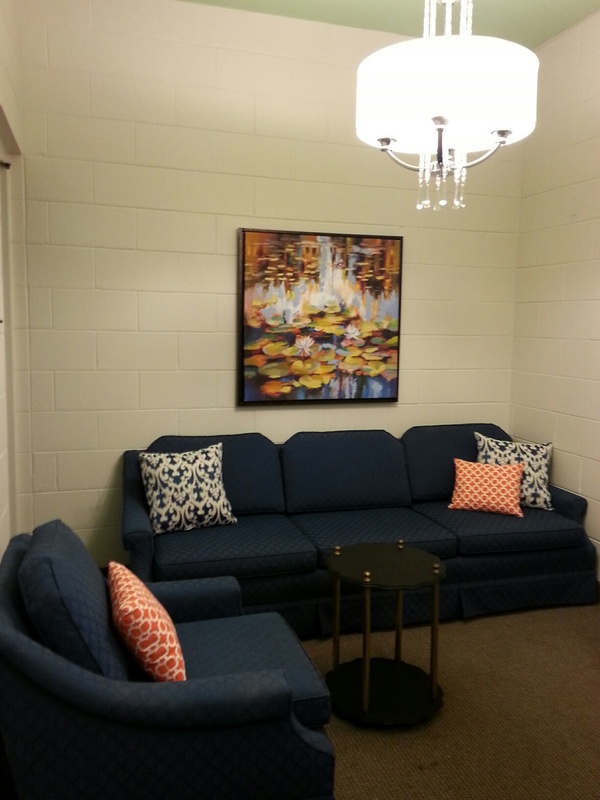 The accent colors of the orange and green were pulled from this painting and it made the whole room work together. Be patient to find exactly what you are looking for. I passed up many possibilities before deciding on what would be workable for the space. The dining table had to be expandable to fit larger groups and the sofa had to hold up well to constant use and needed to be compact to fit in the narrow room (no wide arms please and thank you!). By being diligent and looking not only on Kijiji and Craigslist, but also at my local consignment shops I was able to act quickly when what I wanted came available. I didn’t settle one bit! By being willing to take a chance on used versus new items, I was able to get far more bang for my buck for this lunch room. But if you choose to go this route, always check for wear, bugs, rips, and the like before making a purchase…you can’t return these items so you must be diligent to check out everything! I painted the chairs and table, recovered the dining chair seats and dyed the slipcovers, (and freely offered the time to do this project) I was able to splurge on the larger items mentioned earlier. 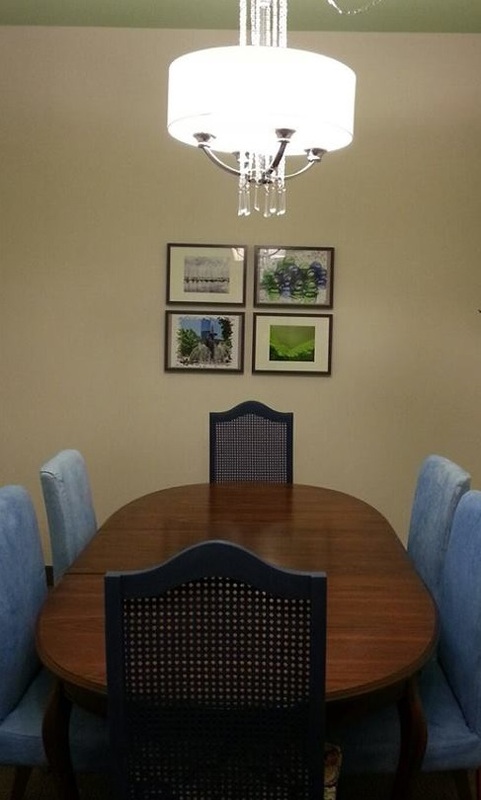 The donated dining set and artwork also went a long way to keep the budget in check (thanks also to Victoria and Kim). By having a clear, yet realistic vision you CAN find stylish pieces for even the smallest budgets! A coat of paint can work wonders and local thrift shops and online marketplaces are treasure troves for the diligent shopper. As I mentioned in Point 2…don’t settle-get creative instead!